In the new Next City feature “Who Will Pay America’s $1.5 Billion Recycling Bill?,” writer Sarah Laskow explores an alternative to the country’s current land-fill-avoidance approach, namely the one that has cities picking up the tab for disposing of corporate America’s waste. You may feel good about faithfully putting every bottle, box and shred of paper into a blue bin, but the stats Laskow cites pack a reality-check punch. From 1985 to 1995, the percentage of municipal solid waste that was recycled grew quickly, from about 16 percent to about 25 percent. If we’d kept that up, we would be closing in on recycling half of our trash by now. But that pace started to slow, and 20 years later, according to the Environmental Protection Agency, the recycling rate still hovers just under 35 percent. Still, cities have been — and can continue to be — leaders on improving recycling. Here, a quick urban-centric history of the charge to fight mindless disposal. Forget ecotopian stereotypes. Don Sandersen, a Republican city councilor in suburban Woodbury, New Jersey, outside of Philadelphia, engineers the nation’s first municipal curbside pickup. Inspired by a local Girl Scout troop’s collection effort, Woodbury pulled a special trailer behind its trash truck. Sandersen went on to consult nationwide and internationally about municipal recycling. A media circus follows the travails of the Mobro 4000, a trash barge laden with New York City trash that traveled from Long Island to Belize and back, stopping in various ports of call along the East Coast and Mexico but failing to find a home for its load. The breathless live coverage of the “Barge to Nowhere” and “Gar-barge” generated a heated national debate about landfill capacity and recycling to reduce the waste stream. Berkeley is one of the first U.S. municipalities to ban expanded polystyrene, which is found in shipping pellets and takeout containers. The Integrated Waste Management Act of 1989 leads California communities to pioneer single-stream recycling. Pasadena, California partners with the state’s Department of Conservation and the NFL to recycle 20 tons of beer cans and hot dog wrappers following Super Bowl XXVII. The Rose Bowl recycling effort was then the largest such stadium effort to date. San Francisco is the first major U.S. city to offer municipal composting. San Francisco adopts a goal of zero municipal waste — everything will be recycled or composted — by 2020. No other city in the world has attempted this feat. Hawaii passes container deposit legislation, the most recent of the 10 states who refund consumers some pocket change for returning everything from runners’ castoff water bottles to a frat house’s empty beer cans. Sure We Can is founded in New York City to represent the estimated 5,000 “canners” who earn an income from collecting recyclables, usually piled high in bags on shopping carts. San Francisco becomes the first city to ban plastic shopping bags. Seattle Public Utilities requires all residential homes to backyard compost or participate in a citywide food and yard waste collection program, further steps on a path to zero net emissions by 2050. 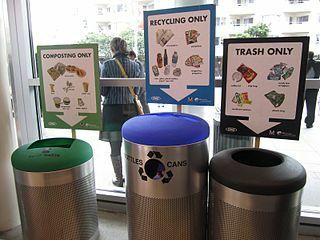 San Francisco implements a $100 fine for composting non-compliance. Governor Jack Markell chooses the Cherry Island landfill in Wilmington, Delaware as the backdrop for his Universal Recycling Law signing ceremony. The bill offers single-stream curbside recycling to every state resident. Portland, Oregon becomes the first major U.S. city to stop picking up trash weekly. U.S. municipal recycling rate plateaus at 34.5 percent, up from 9.6 percent in 1980. Redemption, a documentary about New York City canners, is nominated for an Academy Award. The first year of operation for the Sims Municipal Recycling Facility on the Brooklyn waterfront, which receives recyclable waste by barge — a marked change from the Mobro export disaster. Its sleek design wins architecture accolades and helps defeat NIMBY sentiment. Seattle ordinance banning food from household trash goes into effect. Offending trash cans will be tagged with a red warning — a form of public shaming — and starting in July, the offense will occur a fine.